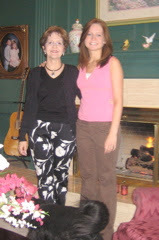 This picture was made in the spring of '05, but I think the two lovelies look like that today, pretty much. Laura is wearing heals, and I'm not, hence the height difference. Anyway, I found this picture just now and wanted to share it. August 27 marks a big day for both of them. Will turns 23 that day , and Laura boards a plane for Florence, Italy for a study-abroad program. She is majoring in Art History at Baylor and there is no greater place to study that than in Florence. Oh, okay--- I cut and pasted so it will be at the top.. ..... I think. look at you, putting up pictures all by yourself. such an apt pupil. I sure do love everyone in your pictures. How lucky am I to have them all in my life? Pretty dang lucky. Ah shucks, Bailey. We love you, too! !